The assistant U.S. Secretary of Transportation was in Cedar Rapids today to hand over some 23-million dollars in federal disaster money for roads. Iowa Department of Transportation spokesperson, Dena Gray-Fisher, says the money has two purposes. She says it will reimburse the state and counties that had to make emergency repairs to bridges and roads as the result of the tornadoes or flooding. The other is for permanent repairs to road and bridges, repairs that have waited until the federal money has arrived. 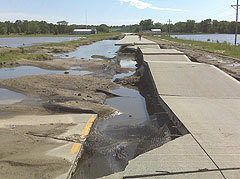 Gray-Fisher the record June flooding buckled or washed away miles of Iowa roadways and bridges. Gray-Fisher says the state road system is probably in the best state of repair as the damage was repaired right away to get traffic moving again. She says many county roads are still in need of "serious" repair, and this money will let the counties make the repairs. Gray-Fisher says the money will go out to individual counties based on need. Gray-Fisher says each county or city made a damage estimate, and as they make repairs, the money will be reimbursed. She says the emergency repairs will be reimbursed 100%, while the non-emergency repairs will be reimbursed at 80 to 90%. The money is in addition to over 13-million dollars FEMA public assistance that has been used to repair roads and bridges across the state. Counties affected by this disaster included: Adair, Adams, Allamakee, Appanoose, Audubon, Benton, Black Hawk, Boone, Bremer, Buchanan, Butler, Carroll, Cass, Cedar, Cerro Gordo, Chickasaw, Clarke, Clayton, Clinton, Crawford, Dallas, Davis, Decatur, Delaware, Des Moines, Dubuque, Fayette, Floyd, Franklin, Fremont, Greene, Grundy, Guthrie, Hamilton, Hancock, Hardin, Harrison, Henry, Howard, Humboldt, Iowa, Jackson, Jasper, Jefferson, Johnson, Jones, Keokuk, Kosssuth, Lee, Linn, Louisa, Lucas, Lyon, Madison, Mahaska, Marion, Marshall, Mills, Mitchell, Monona, Monroe, Montgomery, Muscatine, Page, Palo Alto, Pocahontas, Polk, Pottawattamie, Poweshiek, Ringgold, Scott, Shelby, Story, Tama, Taylor, Union, Van Buren, Wapello, Warren, Washington, Wayne, Webster, Winnebago, Winneshiek, Woodbury, Worth and Wright counties.